"I think of Sid Catlett as being the last of the swing drummers. Max Roach, to me, is the first bebop drummer. Kenny Clarke was the bridge." 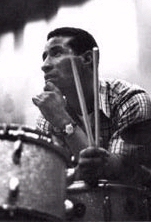 Max Roach first played drums at the age of ten in gospel bands; this early involvement with black religious music had a significant influence on his musical develpment, though he also studied formally at the Manhattan School of Music. In 1942 he became associated with Charlie Parker, Dizzy Gillespie and others and, as the house drummer at Monroe's Uptown House, participated in the jam sessions there and at Minton's Playhouse that led to the development of the bop style. From the 1940s Roach played and recorded frequently with bop groups in New York, notably as a member of quintets led by Gillespie (1944), Charlie Parker (intermittently 1945-53), and Bud Powell. During the same period, however, he also performed with musicians as dissimilar as Louis Jordan, Henry "Red" Allen, and Coleman Hawkins (with whom he made his first recording in in 1943--Rainbow Mist, Delmark), and took part in sessions with Miles Davis (1948-50) which were later issued as Birth of the Cool. From 1954 to 1956, with Clifford Brown, Roach led an important quintet; this group produced a number of seminal recordings, including Study In Brown and At Basin Street, that epitomized the style of jazz known as hard bop. During the late 1950s and early 1960s Roach made a series of recordings that prefigured developments associated with free jazz. In the 1960s Roach became an articulate spokesman and activist in the black-American cultural arts movement. Roach has continued to work regularly with his own groups. Roach holds a significant position in the history of jazz. His imaginative performances as a soloist and his mature technique of improvisation, which is based on the use of deft interaction of pitch and timbral variety, subtleties of silence and sound, rhythmic and metrical contrast, and a refreshingly flexible approach to the fixed pulse, establish him as one of the most outstanding and innovative drummers of his time. "Drum Conversation" [mp3] from 1953. --OLLY WILSON, from The New Grove Dictionary of Jazz. A selected discography of Max Roach albums. Max Roach Quartet, 1953, Debut. Max Roach Plus Four, 1956, EmArcy. Deeds, Not Words, 1958, Riverside.